What is a network in business terms? A network is a diagram, which connects elements, in this case people. The formal organisation chart of your business is a network; it shows in diagrammatical form, who reports to whom, and identifies the formal reporting lines. A corporate network is a similar diagram to the organisation chart, however it captures different information and is a powerful tool for any manager to understand their business, or their area of the business. Is the corporate network the same as the organisational chart? It is possible, however unlikely. Power and authority is not always reflected in job title; it can be delegated, or can change according to a particular situation or project. Particularly for large-scale programmes, which are implementing wide-scale company change, it may not be evident from the existing organisation chart, who are responsible and who are the key decision makers. Some decisions fall to numerous managers and it is not always clear who makes the final decision. Delegation can also mean that decisions are made by managers different than the organisation chart would indicate. In addition there can be people, such as respected authorities that are not managers, but due to their knowledge and experience, have a strong influence over particular decisions. Is this information something that is widely communicated? Not necessarily, some information contained in a corporate network diagram can be highly sensitive and as such you may not want to pin the diagram up on your notice board. However there may be instances where you want to discuss the network with others, to gather knowledge and discuss elements in the diagram that are not clear. Your corporate network diagram can be a useful discussion tool to highlight areas of exposure, due to lack of clear management. How do you Build a Corporate Network Diagram? Decide on the scope of your diagram. Is it for a particular change programme that you are managing or involved in? Is it company wide or for a particular function that you manage? Starting at the bottom of your diagram, decide who are the key groups of people that will need to change or that perform the work. Capture these at the bottom of your diagram. Working upwards, decide who are the key people that these people will go to for advise and leadership. It is most likely that this will include their managers but there may be other key influencers that you wish to capture (for example: staff representation groups). Continue in this manner moving upward in your diagram. Managers also look upward for guidance and leadership and the higher you move upward the more likely that your diagram will start to digress from the organisational chart. Particularly with large-scale change, the lines of management and decision-making are not necessarily clear, with many functional managers from across the business playing an important role. Consider your Place in the Corporate Network Diagram? It is very likely, if you are drawing this diagram, that you play a key role. Perhaps you are a manager or implementer who has to deliver and make things happen. Consider where you sit in the diagram? Do you have authority over the people that need to do the work? It may not be directly, but do the lines of command lead to you? If not, you will struggle to get things done. Leading on from this look for gaps in the diagram. Are there people that you need to do work for you, but you have no official authority over them? 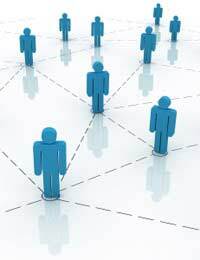 Look for other lines of influence in your corporate network diagram that you may be able to utilise. Finally a corporate network diagram is only effective if it is current, and such a diagram can change very quickly. Regularly update your network diagram, and by understanding the content, you can very quickly find it’s strengths (which you can use to great effect) and it’s weakness (where you can focus on to improve relationships and avoid future difficulties). Are You Ready for a Management Career? What's Different Now You're Management?